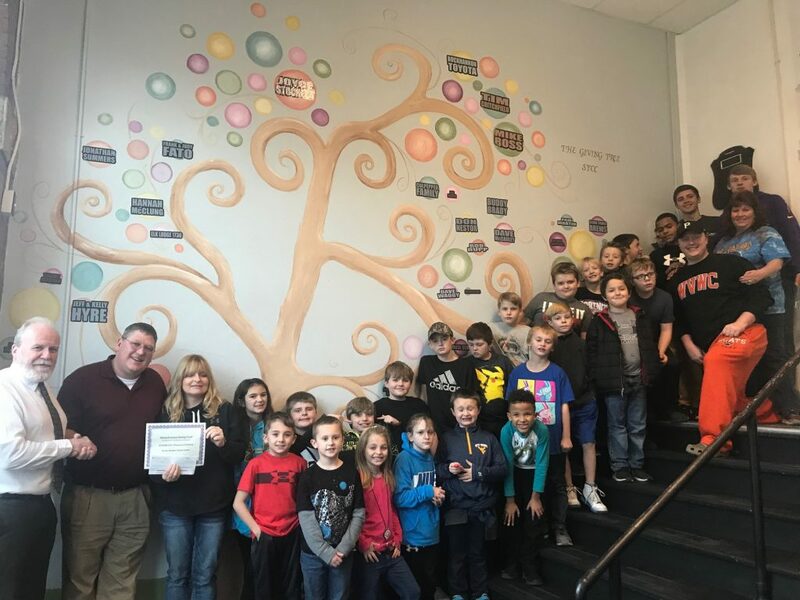 David McCauley, Mayor of Buckhannon, Lance Miller, Weyerhaeuser Plant Manager, Debora Brockleman, SYCC Director, and members of the afterschool club celebrate under the SYCC Giving Tree. BUCKHANNON, WV: Stockert Youth & Community Center Director, Debora Brockleman, received some good news recently: the Weyerhaeuser foundation awarded the center $10,000, which will go toward building the new multipurpose space. With this latest addition, the capital campaign now stands at $268,000 dollars. Thank you, Weyerhaeuser! The additional space will allow the athletic programs–including the very popular recreational basketball program–to continue to thrive. The space will also allow for larger community events and classes that would not otherwise be possible in the current building. Stockert Youth & Community Center sits on Main Street along the Elizabeth J. “Binky” Poundstone Riverwalk trail system and accessible sidewalk network; the new space would serve as a central trailhead and allow for indoor walking and cycling. The space may also be used for Strawberry Festival events and as an indoor space for Festival Fridays during inclement weather.